I’ve always been an over-analyzer. The kind of girl who rarely takes anything at face value. Occasionally it gets me into trouble, but every once in awhile it gives me the best view of what I think is the beauty of life: its subtexts. People are complex and layered, and what you see on the surface is almost never the whole story. The same goes for cultures, relationships, history. Life is just so textured. My sharpest memories of my time in Rwanda are like polaroids of paradox and dimension. Each scene a case study on juxtaposition and an opportunity to peel back layers and reveal the fruited subtext. In 2008, Rwanda became the first country in the world to boast a parliament with a female majority. An impressive 56% of representatives are women – more than triple the percentage we enjoy in the United States Congress. But this statistic paints only a corner of the canvas that is women’s empowerment in Rwanda. 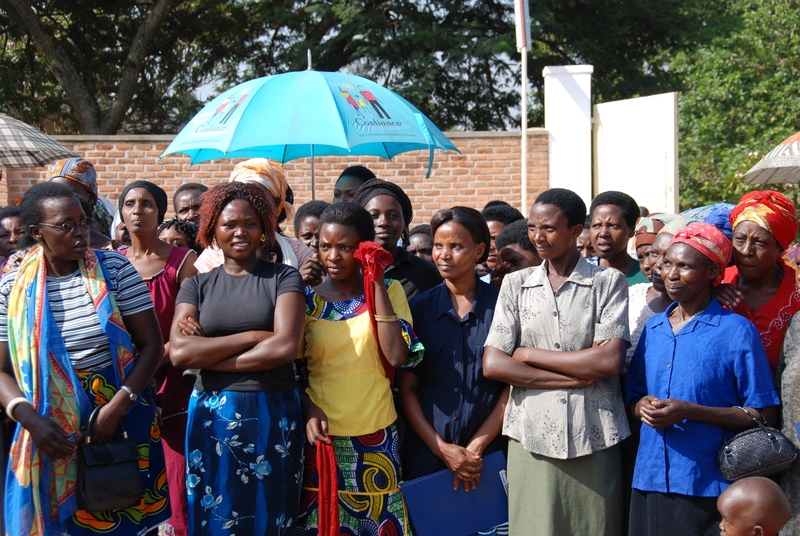 Outside of the government, Rwandan women are still in great need of education about equal rights to basic things like voting and property ownership. I observed the women in our program being taught and encouraged simply to go to the bank – an intimidating place perceived as a man’s domain. I interviewed Antoinette, a beautiful and entrepreneurial graduate of our program, about her successes selling her handmade jewelry (a skill she had learned through Women for Women International programs). She proudly showed me one of her favorite pieces – a woven pair of orange earrings – and explained that when she sells her products, she can afford to pay the school fees for her seven children. In a country in which less than 5% of the population enjoys electricity, Antoinette would later ask me and my colleague for our e-mail addresses to stay in touch. I’m not sure how she accessed the internet or who translated her message to English, but I do know that I got a very nice email from her just a week later. At various memorial sites I saw the physical remains of victims of the 1994 genocide – blood-stained clothing and skulls with still-visible machete wounds – but I also felt a remarkable resilience and forgiveness from its survivors. Even in the wake of complete devastation, there is a hopeful focus on the future. On the grounds of the Kigali Genocide Memorial Centre is a “Fountain of Reconciliation” meant to physically embody this spirit and remind visitors of Rwanda’s commitment to a new day. It seemed to me as if, by enduring the deepest kind of loss, the people of Rwanda had gained the deepest sense of humanity and appreciation for life. I was grateful just to soak it in. And then there was some lighthearted fun. One night we enjoyed dinner at our hotel while a gregarious hotel singer/guitarist named Didier played traditional African ballads, soon to be interspersed with his rousing but unexpected covers of… Whitney Houston and The Rolling Stones. We soon found ourselves at the center of an impromptu dance party with the kitchen staff and waiters, who had been uniformly soft-spoken until then. We tried to learn how to move as gracefully and elegantly as they do, while demonstrating for them how to “twist and shout.” (They picked it up in no time). They didn’t know our names, and we didn’t understand the words to their songs, but there’s nothing like music and dance to bring people together. And togetherness, it seemed, is something Rwandans do well. We noticed a few pairs of towering men walking down the streets of Kigali, with a closer look revealing that they were holding hands like children in a sandbox. Apparently men in Rwanda can express their friendship without the fear of emasculation that often keeps American men an arm’s length apart from one another. It made me think about how drastically cultural norms differ around the world. And as for my world, I couldn’t help but rethink all of my messages in a bottle – everything that I never express because for whatever reason I don’t feel allowed. 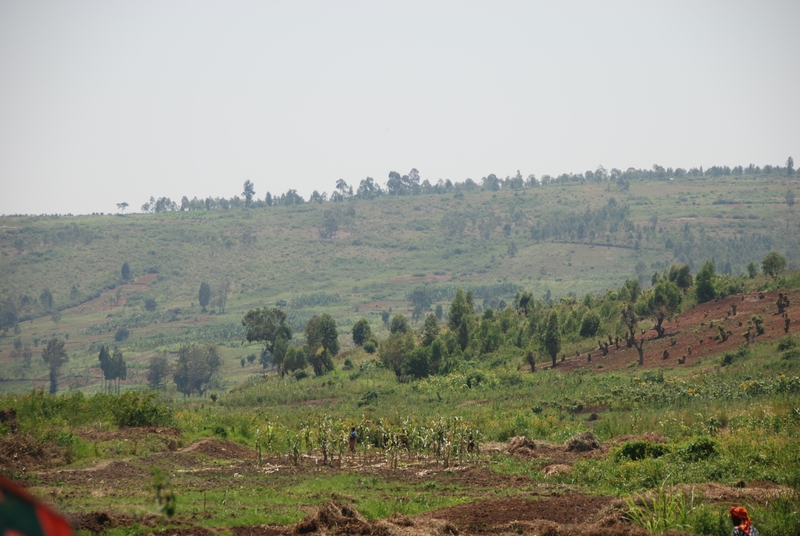 Throughout my time in Rwanda I was continually humbled – almost a little embarrassed – by the hospitality and broad smiles of a people who have endured so much more than I can even imagine. It seemed everywhere we went we stepped into a reception fit for royalty. I felt a bit unworthy of all the welcome performances and outstretched arms and even the waves we exchanged with children along the side of the road. And for an extra helping of humility, the most exuberant smiles and waves seemed to come from the children with the least. But perhaps the most expected (or cliché) juxtaposition – an “us” and a “them”– was noticeably absent. In spite of our differences and the vast sea between us, we felt connected with the people of Rwanda in a way that transcends distance, circumstance and cultural perspective. Sometimes all it takes is a real hug or a knowing glance or a shared giggle at a toddler’s game of peek-a-boo to remind us that we are all one and the same, and the only contrasts between us are the ones we create. 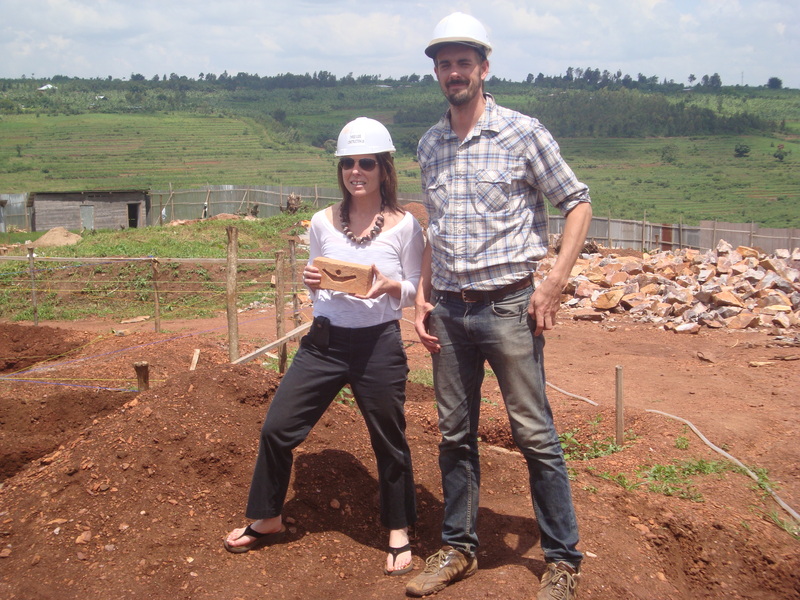 Jennifer Morabito is the Grassroots Marketing Officer for Women for Women International and accompanied a group of supporters to Rwanda through the organization’s partnership with Metta Journeys. 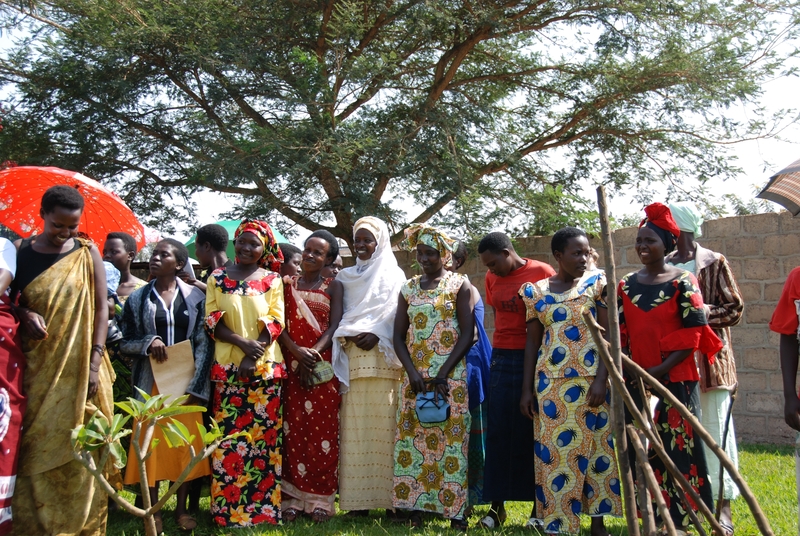 After women have been in the Women for Women International program for one year, they graduate. It’s a big deal. For many this is their first graduation ceremony. They dress in traditional garments and with bellies full of nervous butterflies they come to celebrate. I’ve attended these ceremonies before, but today was special. Today 680 women, the largest class yet in Rwanda, was graduating. We arrive at the “playground”–it looks more like a big field, there are so many people I can’t imagine the number. Later I’m told more than 2,000. I can hear music in the background beyond the sea of bodies and umbrellas. Today the sun is bright and it is African hot, at least to me. We get out with hundreds watching my every move. Without any words spoken, they part and let me pass. They stare, some smile and a few reach out and touch me. I don’t really understand why at the moment. Later I will discover they have already been told a special guest from America is coming. And I just thought I was going to observe–silly me. I am escorted to a tent-covered V.I.P. area. Even the simple plastic chairs are covered in white fabric. Our country director, Berra, was speaking, or trying to. My arrival is causing a bit of a stir as people stretch to get a glimpse of this special guest. I’m still clueless. Finally Berra gives in and introduces me as a sponsor who has come a long way on behalf of other sponsors in America. She asks me to stand and wave. I’m overcome when the crowd erupts into applause, waves and huge smiles. They are so happy I’m here. Okay, now I get it. The program continues with various talking heads, dancing and songs. Even a skit that demonstrates what the women have learned is presented. One of the talking heads is the vice mayor. She has much to say. The crowd loves her and is very responsive to her speech. Fortunately, sitting next to me a Women for Women International staff member is explaining what she is saying. At one point she starts to really urge the women to save some money, stay clean and make sure their children go to school. Then, much to my amazement, she talks about family planning and how important it is. She even asks them by a show of hands who is practicing family planning. Most every hand goes up. “Good,” she says, “do not have more childrens than you have money for; this is very important.” I keep trying to imagine my mayor standing up at some big event and encouraging everyone to bathe and practice family planning. I love their raw honesty. Berra is once again addressing the crowd. Then I realize she is talking about me. She asks if I will come forward and talk to the women on behalf of all sponsors. No pressure here. 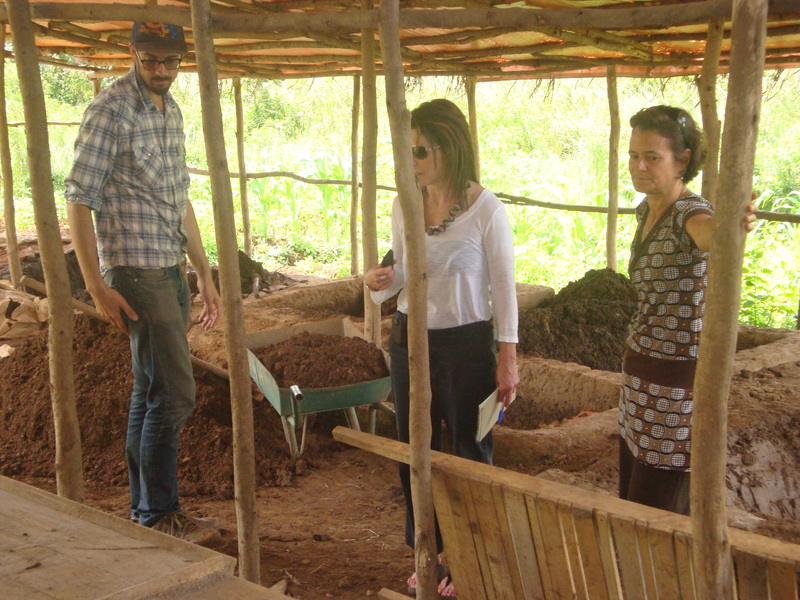 “Muraho, amakuru ki?” They love this–white woman speaks Rwandan. That’s all I know so know Berra helps me from here. I tell them, it is an honor to be here. Everyone of your sponsors are so very proud of you and each of them wishes they were here today. They are all proud of what you’ve overcome and what you are accomplishing now. They know it has not been easy for you, that it is still not easy for you but because of your hard work, it is getting better. I mention the Women for Women International slogan, Strong Women Build Strong Nations and say, “and because of your strength, you are building a strong Rwanda. Murakoze cyane.” Thank you very much. At the end of the ceremony, some two hours later, a final celebration dance erupts. Others sitting in the V.I.P. area are invited to join in the dance including yours truly, the muzungu. When I do so another eruption of clapping and cheers. Try to picture it, under a hot African sun, in the middle of a field, hundreds of Rwandan women dressed in traditional outfits dancing around a crazy white woman who is trying desperately to dance with them. It must have been a sight. At least the film crew thought so because the next morning I’m told by hotel staff, “Hey I saw you on TV last night.” I can only hope this doesn’t make its way to You Tube. Lisa Rico is a sponsor through Women for Women International. She is currently traveling in Rwanda. Today was the day for me to meet a couple of the women I sponsor through Women for Women International. It’s a rare experience for these women as few sponsors travel here. When it does happen, it’s a really big deal. As a sponsor, it’s a really big deal, too. How to describe the experience…I wish you could simply peer into my heart so you would know how it really felt. My large green Range Rover that screams “muzungu” (white person), pulls into a small rural area where a couple dozen locals are hanging out. I scan the crowd, certain I won’t recognize my “sister” from the tiny photo I was given months ago. I was right; I didn’t recognize her at all. But I did recognize the look in her eyes. She knew who we were and moved toward us. We embrace. We embrace again. I can feel her small body shaking. She starts to cry. I offer the handful of Rwandan words I know. Then I need a translator. So good to meet you. How are you? Are you enjoying the Women for Women program? What are you learning? She asks if I could visit her home nearby. We pile into the vehicle and head out. Nearby is farther than I thought, down a long road that looks more like a dry creek bed. All along the way there are children looking with curious eyes and waving at our passing vehicle. We finally arrive at her small mud home. Neat and tidy, with no windows, a low doorway, dirt floor and grass roof. There is no water or electricity. The entire house is about the size of my kitchen. Deborah lives here with her two children, age 13 and 3. Because her brother and sister-in-law were killed during the genocide, her brother’s two children, ages 11 and 13, live here as well. Add her mother and that’s six in this tiny space. I can’t imagine. Deborah says life is better, and I believe her. But she is not one of the many Rwandan women whose big bright smiles leave you thinking, she must have been out of town during the genocide because she looks so happy. No, when you look into Deborah’s eyes you know life has been, and continues to be, a hard, rough climb. We eventually say goodbye, and I leave knowing this is not finished. I know when I wake up in the middle of the night in the days and months to come, Deborah’s face will be there. We arrived into the Kigali airport at 10 p.m. My very first observations walking down the airplane stairs were: the weather (warn and balmy), trees and canopies of leaves and the smoke smell (people burn their trash here). The small Kigali airport was clean, efficient and relatively quiet. Many people welcomed us to Rwanda and then went on their way. Our drivers picked us up. 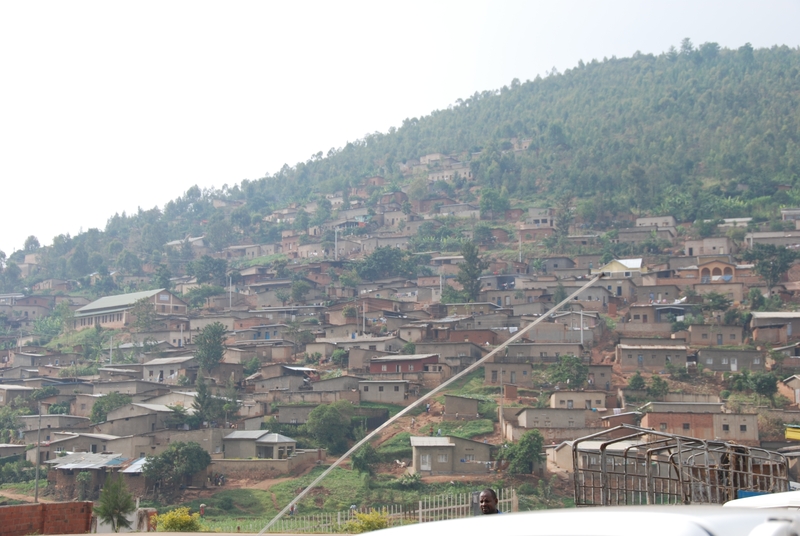 We could see twinkling lights on the surrounding hills as we drove from the airport into Kigali. Paved two-lane roads wound around to the center of the city. There was somewhat of a center of the city, surrounded by homes and hills. It was amazing to hear that 1.5 million people live in Kigali and nearly 10 million people live in this very small country. We arrived at Hotel Milles Collines (Rwanda is know as the Land of Thousand Hills). English has recently replaced French as the official language, though most people still speak the local language–Kinyarwanda. The Hotel Milles Collines was the hotel that inspired the movie “Hotel Rwanda.” You enter through a big gate, and I couldn’t help visualizing what this place must of looked like when hundreds of people were trying to get through the gates during the genocide, seeking the protection on the inside. After we had checked in, we all headed to take a look at the swimming pool. It was surreal to sit there and think about what it must have been like for the people that were trapped in the hotel during the genocide—the people who stayed here actually ended up drinking the pool water when they ran out of fresh water. I guess that is one of the things I couldn’t get out of my head the entire first day here. How did the genocide happen here? It doesn’t seem possible. Unlike Bosnia, at first you don’t see the damage of the war that took place here. The buildings weren’t really destroyed. You don’t see the machetes lying around. But it’s there. Our taxi driver, Remee, told us he lost his entire family during the genocide–mother, father, brothers and sisters. He has no family. He also showed us a machete scar on his scalp. There are other scars, he told us. 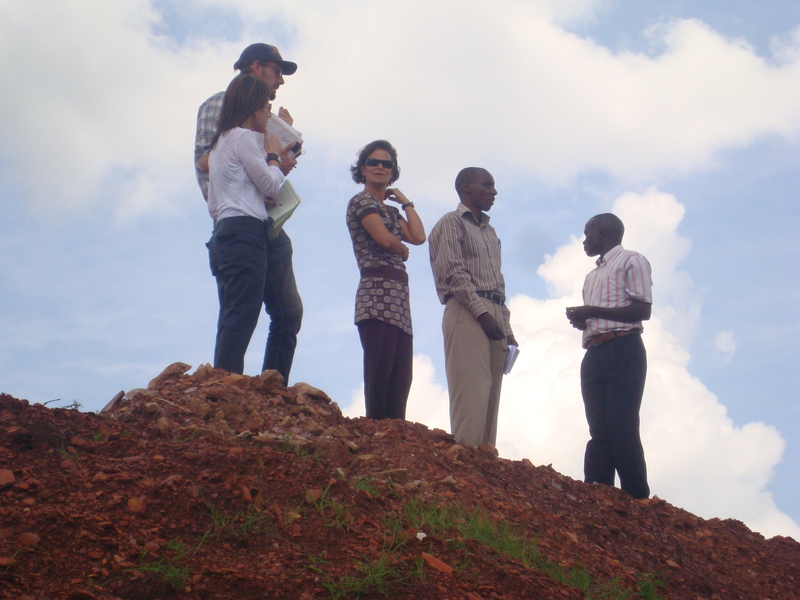 We left the hotel early Wednesday morning to visit the sustainable farming initiative about an hour from our Kigali office. Outside the city, the countryside is a terraced series of hills that go on and on with lots of green valleys and banana trees everywhere, in addition to the potato plant and the tomato tree (like a passion fruit in look and taste). 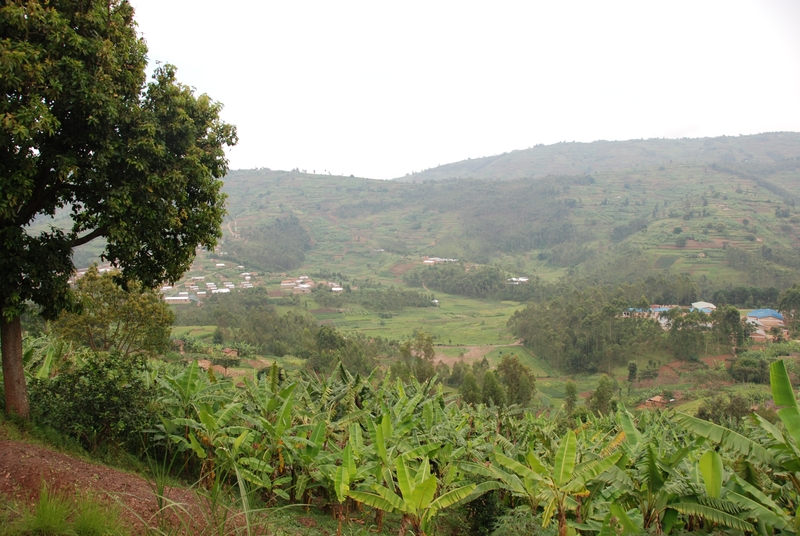 Kigali is very adeptly described as a mountain hamlet—calm and clean. Most of the country is amazingly clean; you will never see any trash. Of course, no plastic bags as these are illegal to bring into the country! You see women walking along the roads with babies happily strapped to their backs. Everyone seems to be in motion—people seem to be everywhere all the time. Even in the winding hills of the countryside you see people walking, riding a bicycle or sitting by the side of the road waiting for a bus ride. 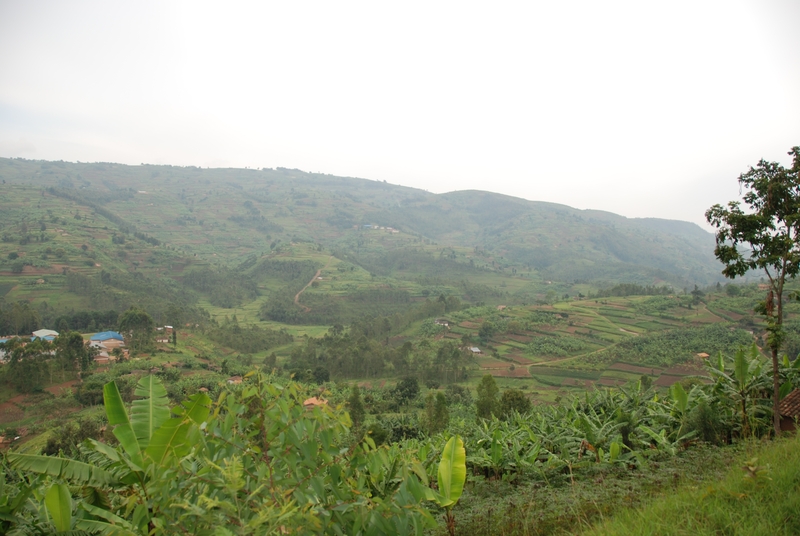 We reached a valley where the organic farming initiative was located. A shelter for the working women and storage area for the tools was being constructed. It was the middle of the day and it was extremely hot. I understand that most of the women work in the morning, at 6 a.m. and work until about 11 a.m. and then sit out the heat. Under the shade of corn husk roof, we saw chili plants blooming. 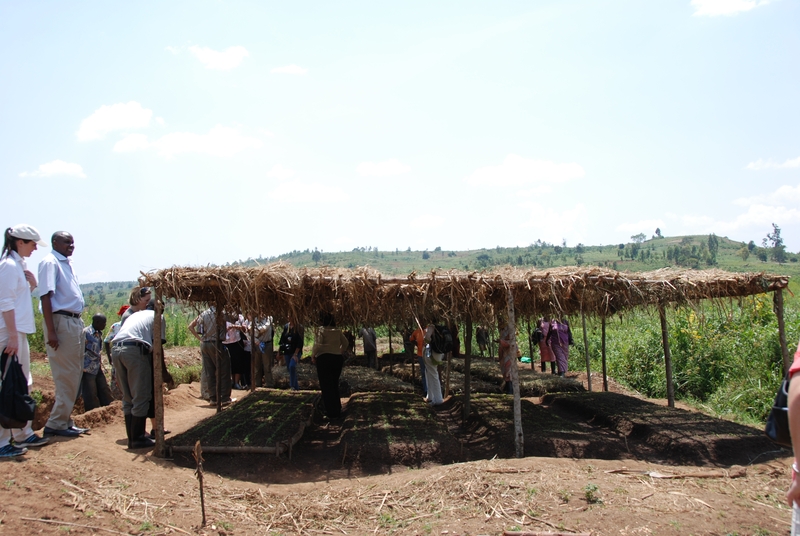 The other crops to be planted were watermelon, tomatoes, passion fruit, beans and corn. The WFWI-Rwanda office has done a tremendous job securing market partners to ensure the women have somewhere to sell the crops they produce. The office has partnered with the largest juicer in the country that buys watermelon and passion fruits. The office will also sell corn and beans to the World Food Program—every crop has a market partner. To me, this seemed absolutely fundamental to ensuring that the women had a sustainable income: markets. We saw the canals that had been dug to carry water from part of the farm to another. There are three other farms like this that the organization has developed. 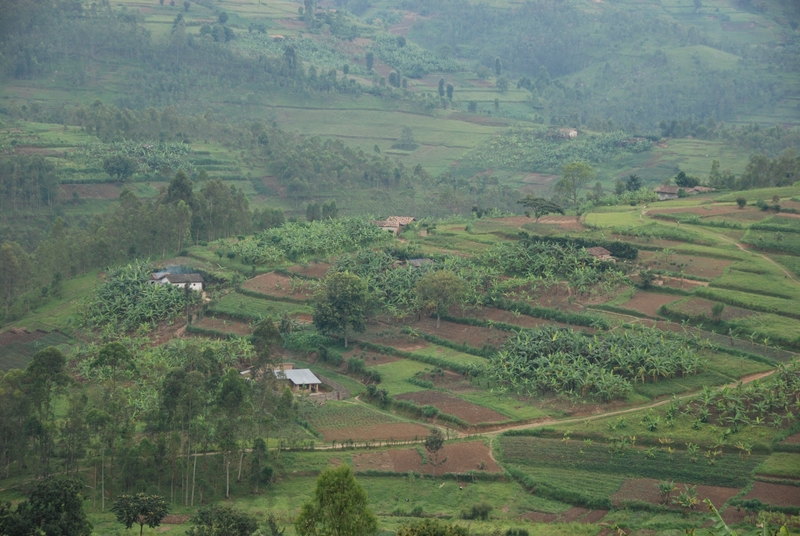 The locations of the farms are Ngenyue, Karongi and Njagama. The idea is to teach women vocational training in farming as part of the program and then give them the opportunity to earn income, post-program. The other key objective is to have the women own the land. The majority of people that work the land around the world are women but they own a very small percentage of the land. Alison Wheeler is the Director of Marketing at Women for Women International.